In September I had an accident which vertically split my upper right eyelid. 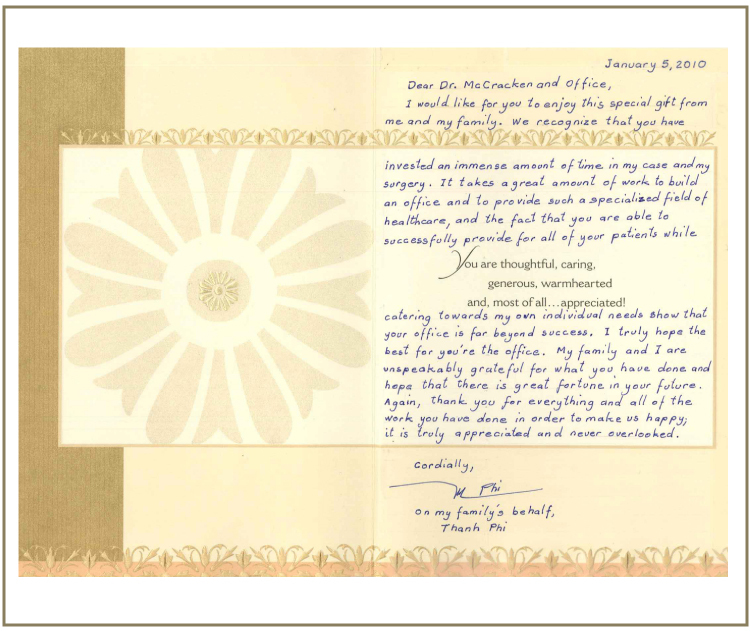 Dr. McCracken's office made room to see me on an emergency basis and scheduled me for surgery a few days later. The entire staff involved in the surgery was great and I received follow up calls to check on my status. Each follow up office visit included an eye exam and detailed explanations with regard to my healing. Awesome services!!! 1 1/2 yrs. prior to my tear duct surgery, Dr. McCracken performed this same surgery on my daughter. Because of my daughters past wonderful experience with Dr. McCracken, there was no doubt that I, too, would schedule an appt. with him. I found Dr. McCracken to be caring, compassionate & kind. He is personal & empathetic. His surgeon skills made me confident that I, too, chose the top doctor! I highly reccomend Dr. McCracken and would never hesitate to see him again. 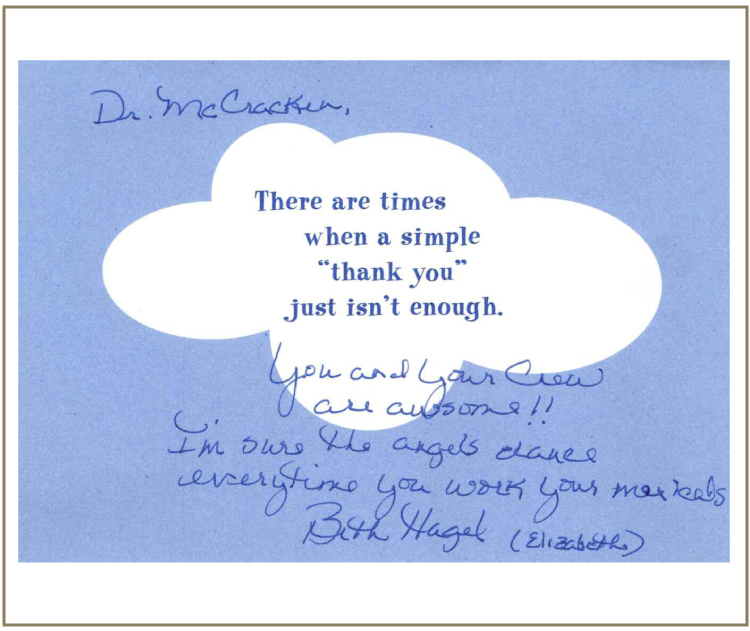 Thank you Dr. McCracken & staff! After several consultations with local plastic surgeons, I finally got my answers as well as peace of mind from Dr. McCracken. He answered my questions and my results are amazing. I am a local Estetician and see many results from various surgeons. 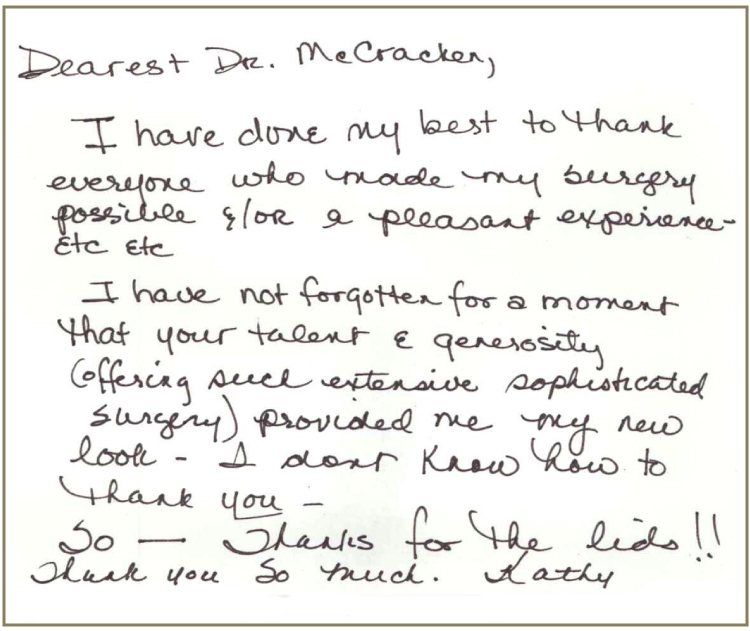 I am very grateful to Dr. McCraken and his staff for delivering nothing but professional and gentle expertise. His fees are quite resonable and I encourage my clientele to schedule a consult and be freed from worrying about who should preform their cosmetic needs. I highly recommend Dr. McCracken for all procedures! I only trust him-he takes his time to evaluate the situation and gives great feedback! He is very professional but approachable with a great sense of humor! The staff is just plain AWESOME! I will be a patient forever! I have referred many friends to see him and they all love their results!! I give his office six stars!! I had a wonderful experience at the Mc Cracken Eye Institute. My appointment was for fillers and Botox. I was greated by a friendly, welcoming receptionist and had no wait time. Lindsey the nurse, has a great demeanor and instantly made me feel comfortable with the procedures . 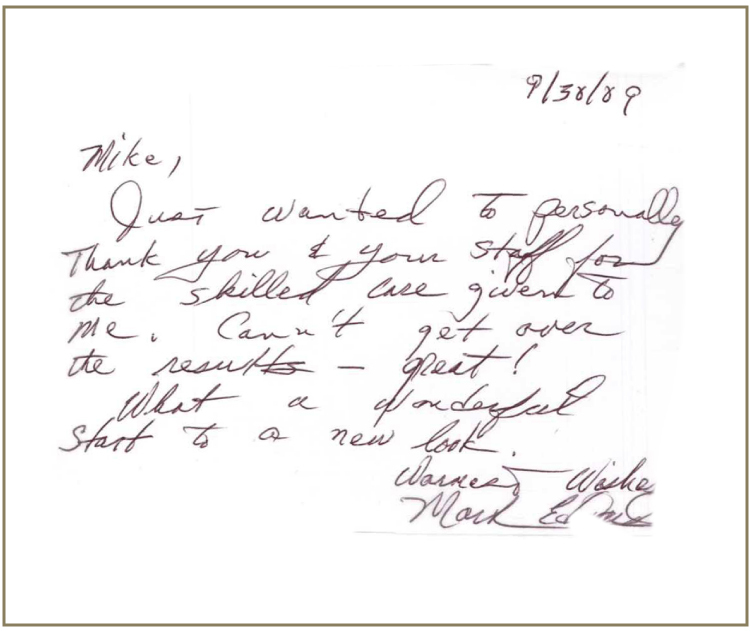 Dr. Mc Cracken is very thorough, takes his time with you to answer questions, and is a true artist. I was pleasantly surprised that my procedures were pain free and I am a chicken. I can see the difference now between going to an experienced surgeon rather than a Nurse or PA for injections and the prices are the same or lower than a lot of the Med Spas. I highly recommend this practice and am going to fly back from Florida for future procedures. The prospect of having basal cell carcinoma removed from your eyelid was concerning with what would be left behind. There was a significant void left that surprising, after 4 months is barley noticeable. 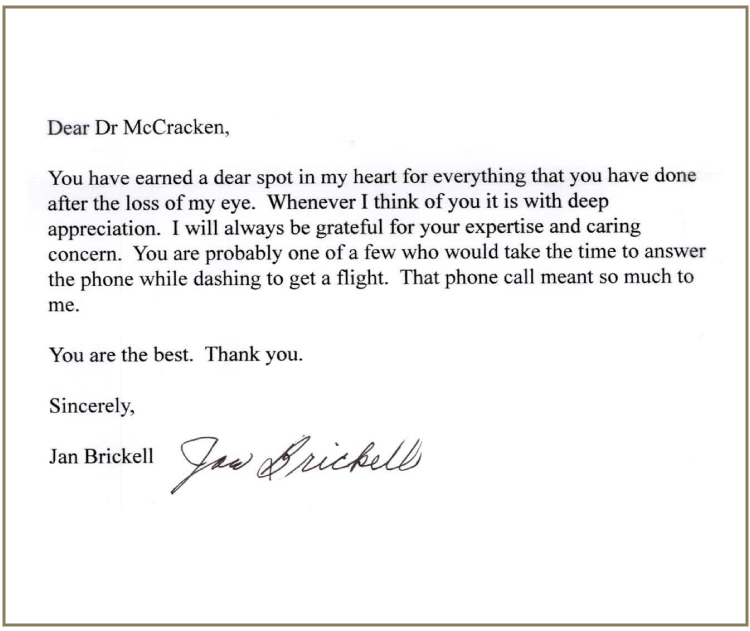 The knowledge and professionalism that Dr. McCracken and his staff displayed was nothing short of exceptional. 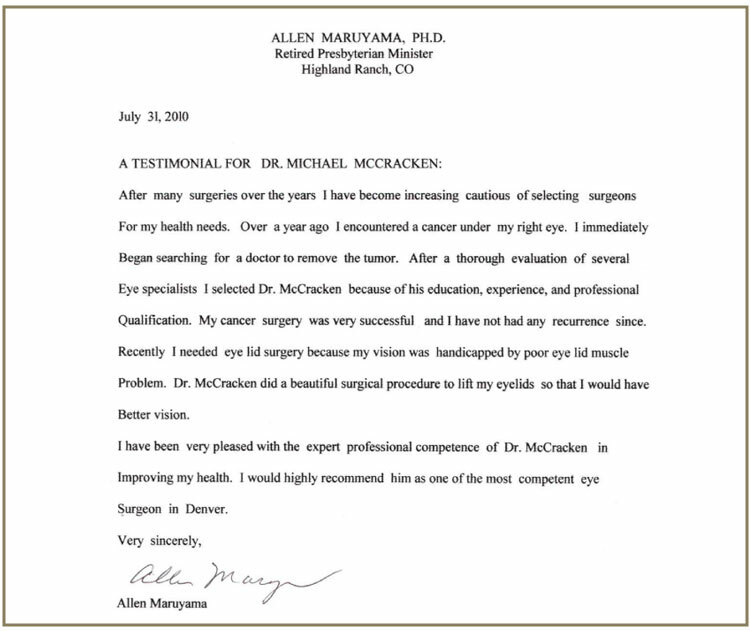 I have no hesitation in highly recommending McCracken Eye and Face Institute. Prior to scheduling an appointment with Dr. McCracken, I visited with two of Denver's reportedly best cosmetic surgeons. Neither impressed me and both quoted unrealistically overpriced costs for a fairly simple procedure. What struck me immediately was the time and attention Dr. McCracken extended to assess and discuss the best option at an affordable price. His assessment was far more thorough than I had previously received and the price he quoted was very reasonable by comparison. Equally important, Dr. McCracken insisted on taking a cautious and conservative approach to the procedure to avoid the risk of causing permanent scaring so close to the eyes. He did so knowing that, in my case, there was a strong likelihood he would have to perform a touch up procedure at very minimal cost. That uncompromising care by itself reflects the man's integrity. 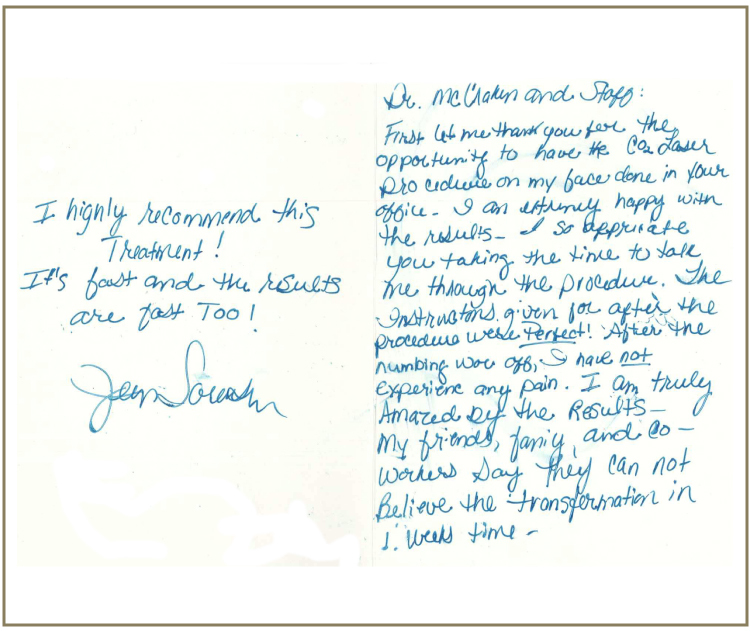 The work Dr. McCracken performed on me was excellent and exceeded my best expectations. In addition, his skill as a surgeon is complemented by a genuine interest in providing the very best results for his patients. I would also add that Dr. McCracken's entire staff is like extended family and everyone radiates a friendly and caring attitude. I am very pleased with the results. 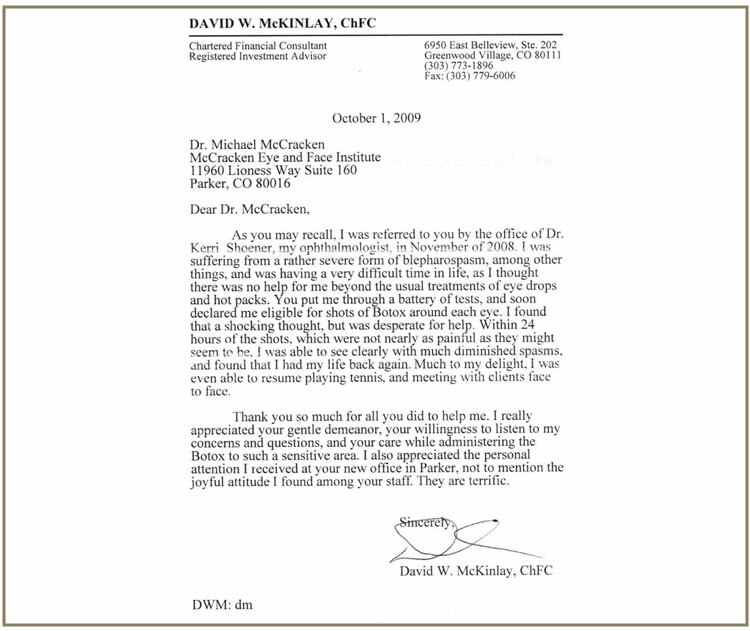 Dr. McCracken is very experienced and knowledgeable in his work. 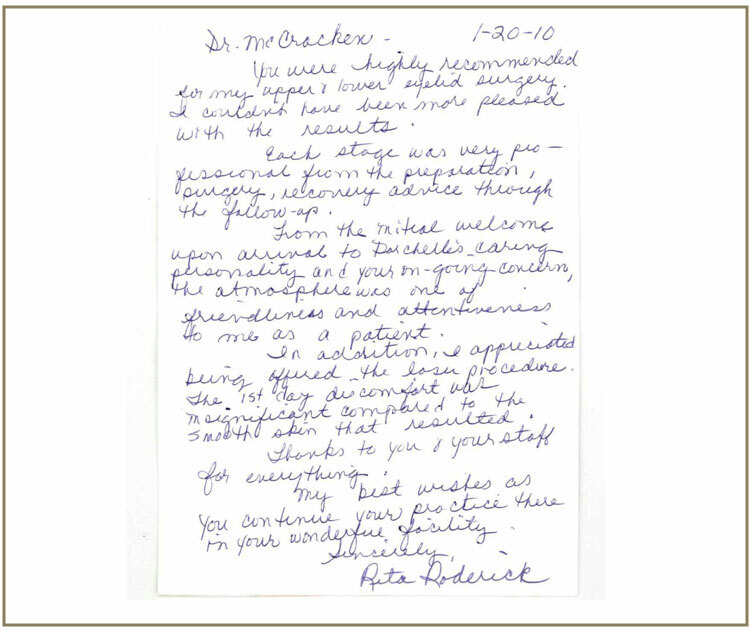 Dr. McCracken gave personal attention and made me feel comfortable with the procedure and the outcome. The office staff is very friendly and makes sure you have a pleasant experience. Dr. McCracken makes you aware of everything so that you can make an informed decision. A very special Thank you to Dr. McCracken and his team. Highly recommend!!! I was treated with the best care ever. The results were far greater than I expected. I have recommend Dr. MvCracken to all I know.